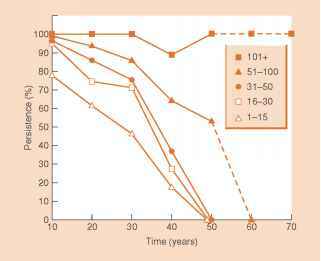 Regenerative processes have higher costs than throw-away processes. However, regenerative processes are chosen when disposal options are limited. 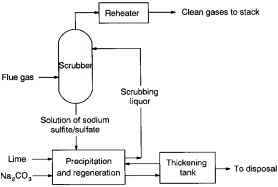 Regenerative processes produce a reusable sulfur product. In Japan, where the government mandates FGD, regenerative processes are used almost exclusively. FIG. 5.20.6 Schematic diagram of a dual alkali FGD system. orator and crystallizer, where sodium bisulfite is decomposed to Na2SO3 and SO2. The gas stream contains 85% SO2 and 15% H2O, thus the SO2 can be used as feed stock for producing S or sulfuric acid. 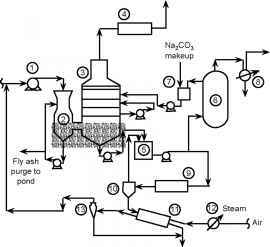 To replace the lost Na2SO3, this subprocess adds soda ash (Na2CO3) to make up sodium. The Na2CO3 reacts readily with SO2 in the absorber tower to give sodium sulfite. Surface condensers are normally shell and tube type and should be set vertically. Vapor should only condense inside the tubes. This arrangement prevents a stagnant zone of inert gas (air) that might blanket the heat transfer surfaces. Figure 5.20.8 shows a typical surface condenser. The feed gas enters the top of the condenser and flows concurrently downward with the condensate.